Boo Ferriss, one of Mississippi’s most beloved citizens, will receive the first The Rube award at the BancorpSouth Mississippi Sports Hall of Fame induction ceremonies July 27 at the Downtown Marriott in Jackson. 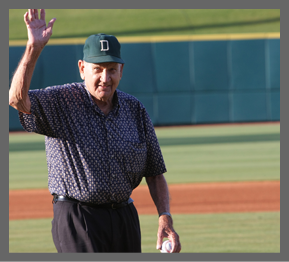 The Rube is named for the late Michael Rubenstein, the Mississippi Sports Hall of Fame and Museum’s first and only executive director until his death Dec. 1, 2011. The award will go annually to a person whose love and passion for — and contributions to — Mississippi sports have made a meaningful difference. Ferriss fits the bill. A Shaw native, the former Mississippi State and Boston Red Sox baseball star built a powerhouse baseball program at Delta State.. There, Ferriss developed many of the high school, junior college and college coaches who have won state and national championships and greatly improved the quality of Mississippi baseball. Michael’s older brother, Ted Rubenstein of Atlanta, knows his sibling would approve. The July 27 festivities will feature the Hall of Fame’s 50th anniversary induction class: Courtney-Blades Rogers, Eddie Crawford, Sam Hall, Jeff Malone, Rafael Palmeiro and Ennis Proctor.